The Hunt for Bismarck Campaign is on your radar and closing in fast! Starting May 19 and lasting until June 8, the new campaign will invite players to take part in one of the greatest naval operations in the North Atlantic, taking them back to May 1941. In the process, they will earn special achievements, rewards and collectibles and decorate their ships with brand new special camouflages! For all of you who will manage to complete the campaign, the grand prize is two custom HMS Hood skins and the Tier VIII German Battleship Bismarck! The campaign will include seven missions and eight tasks describing the historical events of the time. For each completed task, players will receive a special container that will be available only for the duration of the campaign containing special flags, camo, badges and emblems. For the campaign’s duration Premium lootboxes will also be available in the Premium Shop containing various extra unique items. It should be noted that players who already own Bismarck will be compensated with Credits and a Port Slot. After the collection is complete, players will be who obtain any additional emblem pieces will be compensated 10,000 Credits per piece. For full details and additional information you can also visit the Official Page. 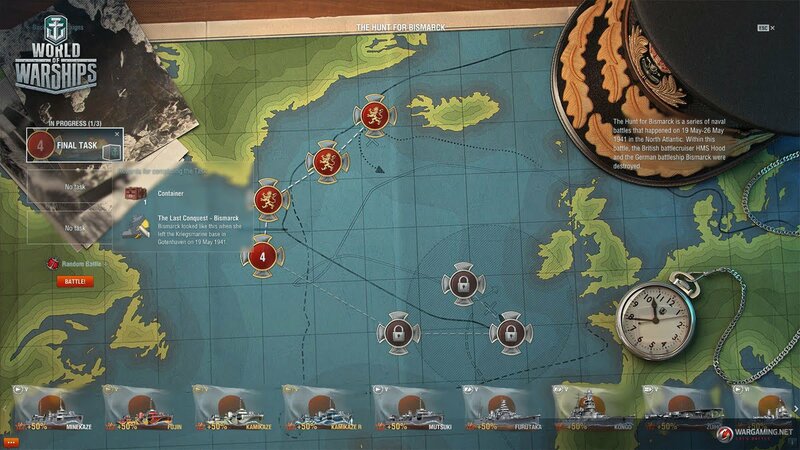 World of Warships: Arms Race!